In the 1970’s, the 16th Gyalwa Karmapa traveled three times to the West. His impression was that the teachings of the Buddha would be able to help people there better deal with their problems. Therefore, he asked Gendun Rinpoche to settle in Europe and teach the Dharma there. 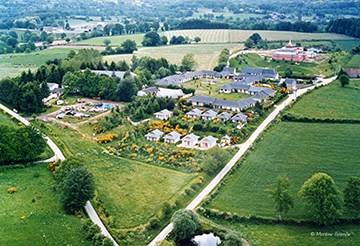 For the location for his main center the 16th Karmapa chose a site in the Dordogne (France) that Bernard Benson, an American industrialist, had given him. The 16th Karmapa named the place Dhagpo Kagyu Ling (the place at which the transmission of the Dharma is passed on that originated with the meditation master Gampopa). In 1975, Gendun Rinpoche complied with his wish and arrived in France, accompanied by Jigme Rinpoche. They arrived without any personal goals or wishes—their sole intent was to realize Karmapa’s instructions in the best possible way. They did this with incredible patience and devotion and without ever saying a word about their difficult circumstances. Soon the first people interested in the Dharma visited the place; some of them stayed and became students of Gendun Rinpoche. In the course of time a community of practitioners arose around him and with their help the outer construction of the center took place as well. In these first years the Dharma was transmitted directly through the daily living together of teachers and students. Gendun Rinpoche himself had deeply realized everything he taught, and this was the force that inspired many people to follow his example. Through his living example and that of the other lamas the students learned how to apply the teachings of loving kindness, compassion, mindfulness and wisdom to their own daily lives. In this way, gradually a deep trust in the Dharma arose in them. The instructions the 16th Karmapa had given Gendun Rinpoche and Jigme Rinpoche among other things included creating a monastery, a temple, an institute of learning, Dharma centers and retreat centers. In compliance with these instructions, a suitable site for this eventually was found in the small settlement Le Bost in the Auvergne (France), and it was called Dhagpo Kundrol Ling (the place where everything is liberated). In 1984, the first three-year retreat began in the former house of Arnaud Desjardin under the direction of Gendun Rinpoche. Three years later when the next group wished to enter a three-year retreat in Le Bost, the first group built themselves a retreat house for their second three-year retreat. Parallel to this, Gendun Rinpoche also looked after a three-year retreat in Halscheid, Germany. In 1991, when a pupil offered Gendun Rinpoche a house with a large garden, the foundation was laid for Laussedat, and from the third generation on all three-year retreats for women took place there. In these retreats under Gendun Rinpoche’s direction the first West European Dharma practitioners received thorough training and obtained all the essential transmissions of the Karma Kagyu school. Additional three-year retreats followed. To accommodate their situation following the completion of their retreats, a place was needed in France where the monks and nuns could live and continue their practice. For this purpose, the community of Dhagpo Kundrol Ling acquired an adjoining piece of land and construction of the monasteries was begun. 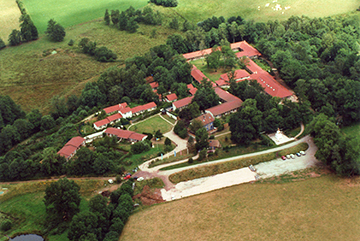 The monastery for men in Le Bost was completed in 1994 and the nunnery in Laussedat in 1996. In addition, already in 1993 the building of a temple was begun, and this has also been completed by now. Dhagpo Kagyu Ling and the monastic communities Dhagpo Kundrol Ling in Le Bost and Laussedat thus formed the foundation of the Dhagpo Kagyu Mandala. Since his arrival in France in 1975, Gendun Rinpoche had frequently traveled in Europe, responding to the invitations of persons who had participated in his courses at Dhagpo Kagyu Ling. In several German towns practitioners gathered in centers in which Gendun Rinpoche taught regularly. 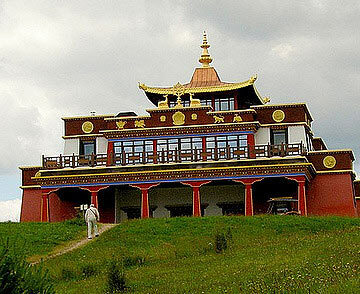 In the Kamalashila Institute (Mechernich), consecrated in 1981 by Shamar Rinpoche, Gendun Rinpoche had regularly and with increasing frquency taught since 1986, while a three-year retreat took place under his direction in Halscheid. Gendun Rinpoche, who had been recognized as a lineage holder by the 16th Karmapa, on account of his realization, the openness and loving kindness radiating from his mind, and his overwhelming compassion attracted people of greatly differing religious and social affiliation. 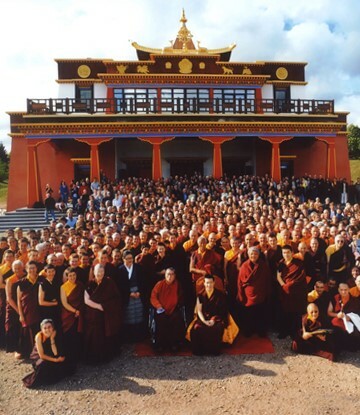 In 1995, on the initiative of Gendun Rinpoche, the Association Karma Kundrol Puntsok Ling (KKPL) was founded and at the same time the Center Jägerndorf was opened in Lower Bavaria, as the first German center of the Dhagpo-Kagyu-Mandala. Around this time, the German speaking lamas who had received their training from Gendun Rinpoche in their three-year retreats in France began to teach in Germany, Austria, Italy, Greece and Switzerland. As a consequence of this, numerous Dharma groups sprang into existence, principally in towns and cities. In addition, starting in 2001, many practitioners met at the yearly Karma Kagyu Easter Course in Fulda, Germany, that evolved to become a central event of the mandala in the German language area. On August 30, 2005, the building was finally acquired in the context of an auction. 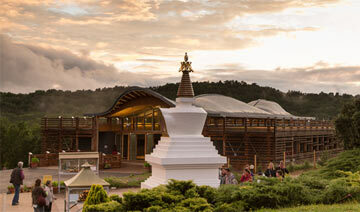 A few days later Jigme Rinpoche blessed the site and consecrated the Dharma Center Möhra. The opening was attended by numerous guests from all over Germany as well as many citizens of the municipality of Moorgrund. Today, the Dharma Center Möhra is the main seat of the Dhagpo Kagyu Mandala in the German language area, and it is taken care of by lamas and drublas of the Dhagpo-Kagyu-Mandala who have received their training from Gendun Rinpoche. It is held by the Association Karma Kundrol Puntsok Ling, the spiritual head of which is the 17th Gyalwa Karmapa Thaye Dorje.